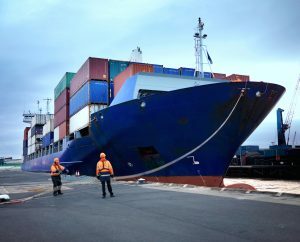 In a move to promote more efficient and secure global trade, shipping giant Maesrk in partnership with IBM has launched TradeLens, a blockchain-based shipping solution. The companies on Thursday said that already 94 worldwide organisations including ports, customs, freight forwarders, transportation and logistics companies are actively involved or have agreed to participate on their platform built on open standards. Using blockchain technology, TradeLens enables digital collaboration across the multiple parties involved in international trade. The trade document module, called ClearWay, enables importers, exporters, customs brokers, trusted third parties such as Customs, other government agencies to collaborate in cross-organizational business processes and information exchanges, all backed by a secure, non-repudiable audit trail. Shippers, shipping lines, freight forwarders, port and terminal operators, inland transportation and customs authorities can interact more efficiently through real-time access to shipping data ad shipping documents, including IoT and sensor data ranging from temperature control to container weight. During the year long trail of the platform, TradeLens reduced the transit time of a shipment of packaging materials to a production line in the United States by 40 percent, avoiding thousands of dollars in cost. “We believe blockchain can play an important role in digitizing global shipping, an area of the global economy that moves four trillion dollars of goods every year,” said said Bridget van Kralingen, Senior VP of IBM.